The photo takes from October 1980. It looks like part of an outside broadcast set up. 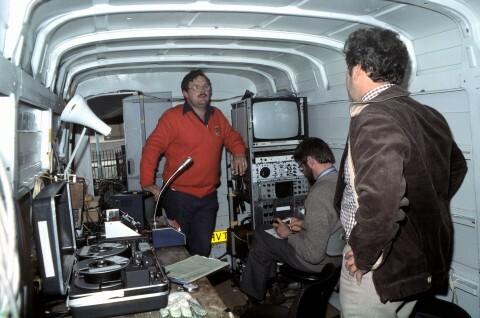 The men in the photo are John Smith (multi camera director), Peter Hodges (sitting down) and Derek Price (engineering manager). The shoot was almost certainly for a ‘Pebble Mill at One’ programme, since John Smith was one of the principal directors on the show. Paul Vanezis added on the Facebook page that the ‘Pebble Mill at One’ titles, with the fisheye look, were in fact recorded on an Ampex VR 3000, as were some of the opening titles of ‘Look! Hear!’. Please add a comment if you can add any information.